The mahadasha of Saturn is generally the best for politicians in a democracy if it owns the lagna, seventh or the tenth house and is involved in conjunction with the lagna, fourth, tenth , eleventh house and/or also aspects the tenth house or the tenth lord or the fourth house and the fourth lord or is exalted as it was in the case of Indira Gandhi , George Bush the former president of USA, his father H.W.Bush, Chandersekhar, a former Indian prime minister even Amitabh Bachchan the actor, Deve Gowda former prime minister, Gulzari Lal Nanda and scores of others. Years ago, when I was given this horoscope by him and was asked to keep it confidential, I wrote an article in the Star Teller of November 2004 WATCH HIM RISE without disclosing his name or any further details. That was the briefest article I ever wrote. There a story seemed to end, a hint given was forgotten. Then when the newspapers started talking about him being the favorite for the post of president of India in 2012, elections for which are to be held in the second week of July, I had to request the Star Teller editor to send me a copy of the article. I had concluded the article saying “As the year 2004 approaches the end, his luck should be stronger than ever before. (Written on 10 September 2004). From 20 September 2011, his antardasha of Venus in the mahadasha of Saturn started---that enigmatic period in which , as the saying goes in Hindi, one becomes a raja from rank or a rank from raja meaning becomes a beggar from the position a king or a king from the position of a beggar meaning rises very high or sinks. It was the horoscope of Pranab Mukherji, the present finance minister, and the choice of the UPA II for the post of the president in the July 2012 election for that highest post. The date of his birth given in different websites as some date in December of that year is wrong. The mention of his name for presidential election made me dig out his horoscope from my records. One noting there is that the marriage of his daughter was fixed for December 1987. More important, his wife (born in 1938), Smt. Geeta (Suvra) Mukherji is a singer of Rabindra Sangeet. I checked to see if she would become the first lady after her husband becomes the president of India. The answer was positive. The date of marriage noted was 13 July 1957. Mr. Mukherji is the fourth child of his parents with two sisters and one brother elder to him and three sisters younger. Mrs. Mukherji is the first child of her parents and has a younger brother. As to the elections, I do not have the horoscopes of the other contestants in the race. From the newspaper reports and television discussions, there appears to be no doubt about his getting elected easily. An astrological analysis may be only a formality in these circumstances but still a glance can be had at the dasha and possibilities. First at a glance: the transits Saturn in transit is on his tenth lord, Mars, in Kanya and Jupiter from Vrisha is aspecting it which is very favorable. And it is also the tenth house from his birth Moon in Kanya. From his wife’s lagna (Dhanu) Saturn is in the tenth house aspected by Jupiter from Vrisha. Her antardasha is that of Sun in the tenth house. I am not revealing her horoscope. Coming back to the horoscope of Mr.Mukherji, he is passing through the dasha of Saturn Venus in the eighth house with Mercury. Venus as the fourth lord is the simhasana or throne and as the eleventh lord gain. In the eighth house of surprises which is what happened as his name became a sudden and surprising choice as the newspapers say. Saturn in the eighth house generally disrupts a career and even when it gives a position in a surprising way, that career is brief or cut short as happened both in the cases of Gulzari Lal Nanda who was prime minister twice for a brief period, once after the death of Nehru and later after the death of Lal Bahadur Shastri, though he had long enough stint as a minister at the center. The career of FDR was cut short in his fourth term; though he had long three terms as the president of USA. The elections will be fought in Saturn-Venus- Moon and the pratyantara dasha lord, Moon is in the sixth house in the lagna and the tenth house in the dashamansha. 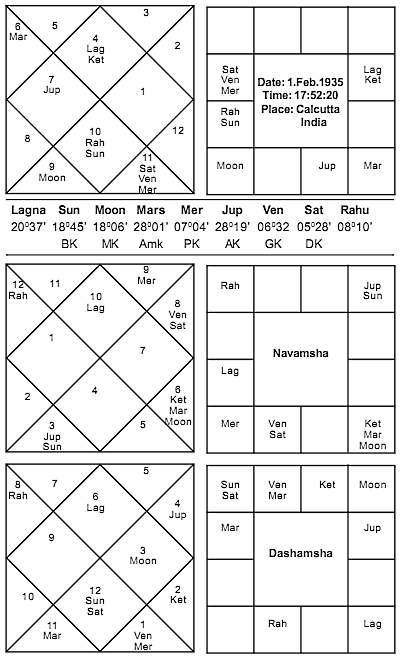 In Chara dasha it will be Simha dasha from where AmK Mars’s aspects the eleventh house while Jupiter, the planet denoting the president generally in mundane astrology, aspects the tenth house (Jaimini aspect). The antardasha is Kanya which has the Amatyakaraka and the pratyantara dasha will be Vrisha from where the fifth and tenth houses show dignity, the dignity of the first citizen of India. There is a negative side to it also. His wife’s health does not seem to be good at all in this period. It seems to be deteriorating gradually and may be worse at the end of this year and next year. If seen more closely, the health of Mr. Mukherji itself may not be good in 2014. Will he complete the term? At the moment, he seems to be winning the election very easily. ATAL BEHARI VAJPAI - HOW MANY HOROSCOPES?